After installing and testing Firefox 1.0PR, I discovered I could install flash plugin a different way. You could say it's the easy way or the Firefox Way! 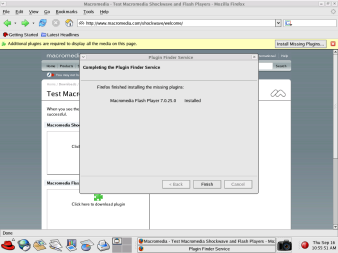 Here are screenshots for intalling flash plugin in Firefox way using Plugin Finder Service. 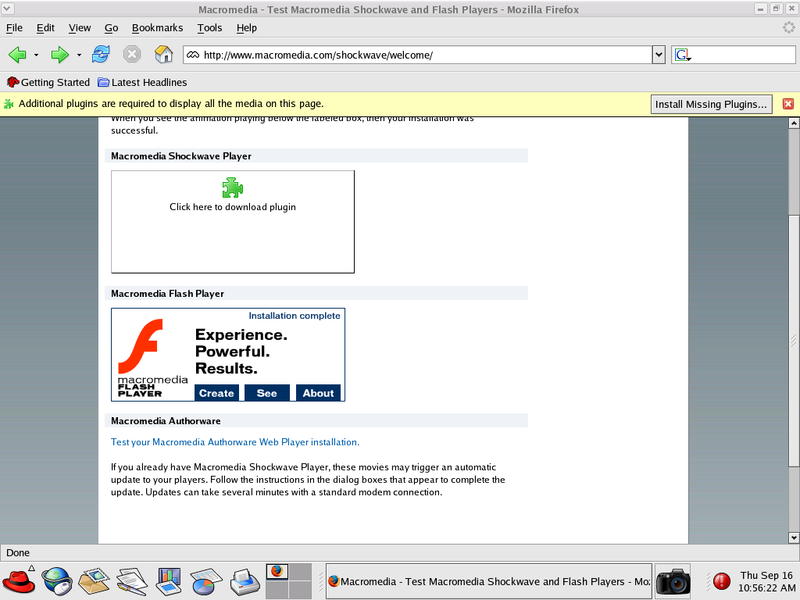 Click on the thumb image to see the full screenshot. 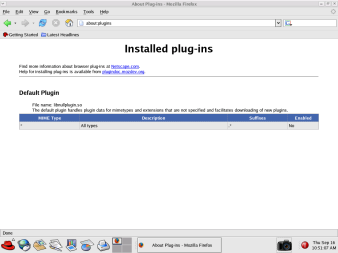 1) Type about:plugins in the URL to see currently installed plug-ins for Firefox. 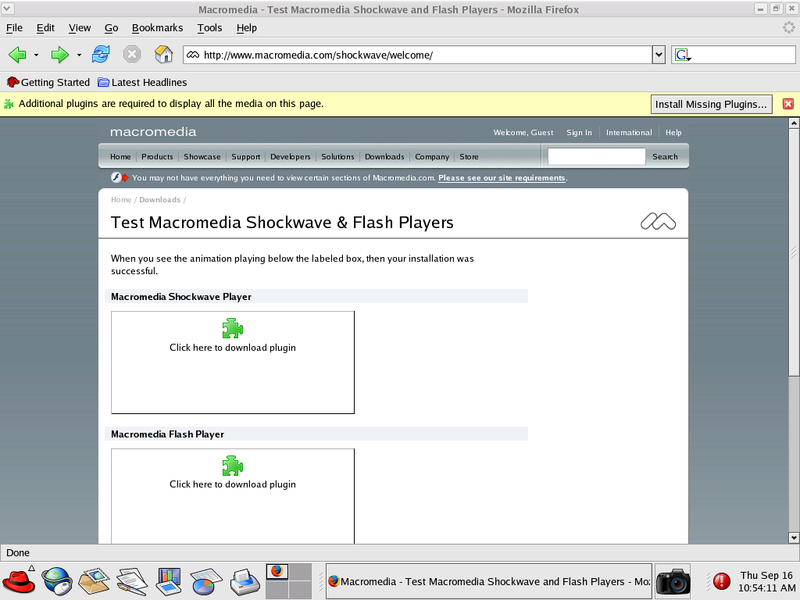 Notice Shockwave Flash has not been installed yet in this example. 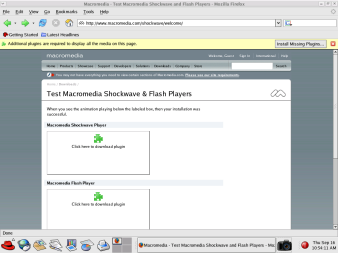 2) Go to Test Macromedia Shockwave & Flash Players site in Firefox. 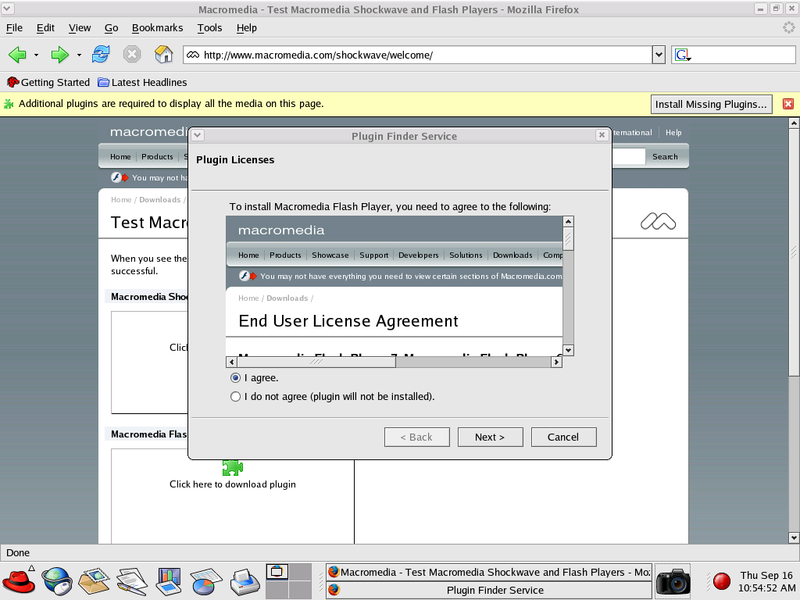 3) Click on Macromedia Flash Player area and Available Plugin Downloads dialog box will pop up. Click on Next button. 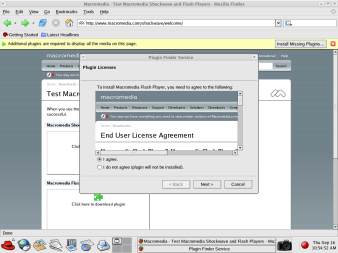 4) Now, you will see Plugin Licenses dialog box will pop up. Choose "I agree" and click on Next button. 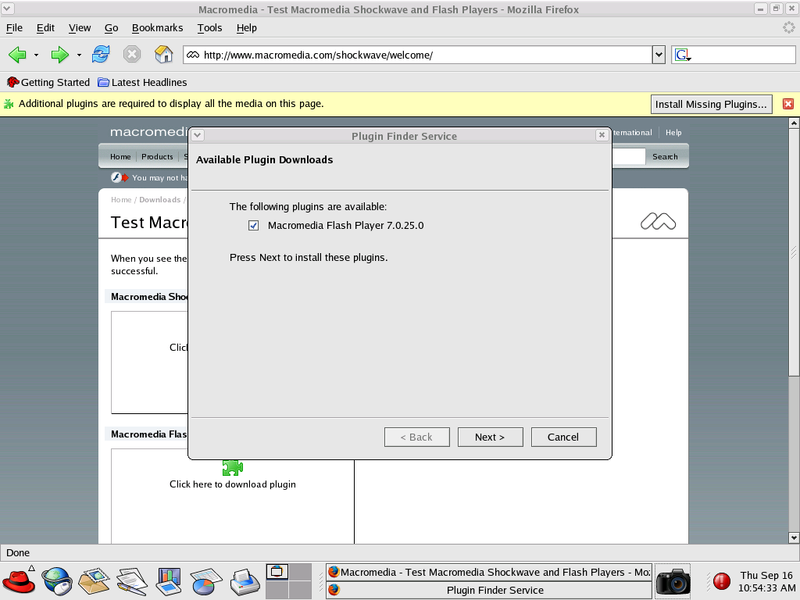 5) Next, you will see Installing Plugins dialog box will pop up. 6) Next, you will see Completing the Plugin Finder Servce dialog box will pop up. Click on Finish button. 7) It's done! Notice Installation Complete under Macromedia Flash Player area and Flash animation is working now! 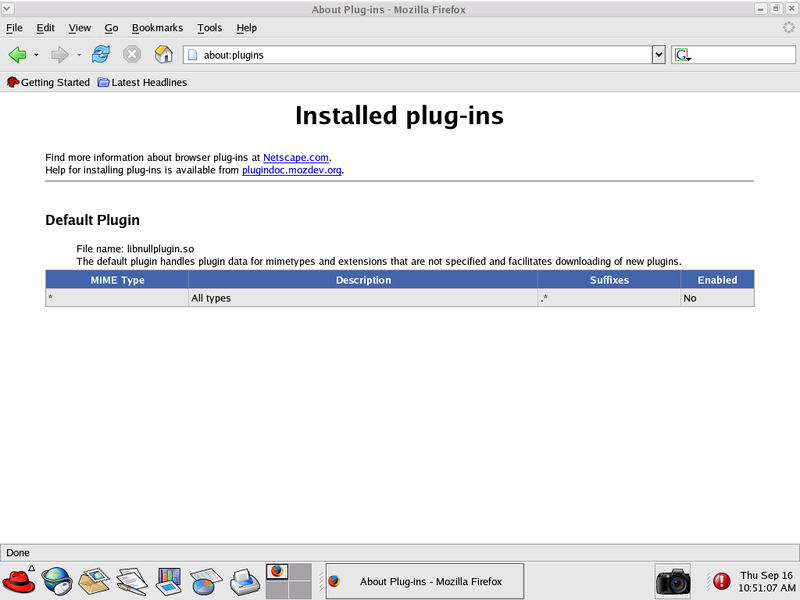 Plugin Finder Service is very cool new feature in Firefox 1.0PR and we can expect to see more plugins will be available for Firefox in this fashion in the future.